When the traffic of Hollywood and the hustle/bustle of Los Angeles are beating at your door, you can get away to a traditional, fun community in Toluca Lake. 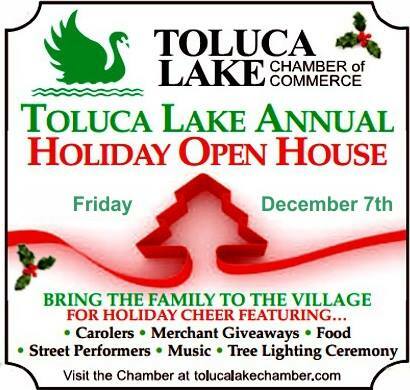 The Toluca Lake Chamber of Commerce brings the community together with the Annual Toluca Lake Open House. Every year on the first Friday of December, the merchants of the Toluca Lake Village open their doors to the community for food, drinks and giveaways. Carolers and music will entertain the streets with holiday cheer and Fritz Coleman will be presenting the Tree Lighting Ceremony. This Friday, December 7th, beginning at 5:30pm, our doors will be open! Ramsey-Shilling Associates is proud be a part of the holiday festivities by hosting Santa Claus for a special photo op with your children. Through our lobby, real estate agents will be serving free wine and snacks for the adults. Also, don’t forget to grab your free Ramsey-Shilling cooler, pen, post-it and/or reusable cup. Photo with Santa Claus for the kids and a glass of wine for you! Come to 10205 Riverside Drive in Toluca Lake and engulf yourself in Holiday Cheer!! !